Buy eyebrow dye at Boozyshop. The make up webshop that makes online cosmetics shopping fun! Are you ready to do your eyebrows every morning? Would you like flawless eyebrows without doing anything about it? With the eyebrow paint from Boozyshop you can make sure your eyebrows stand out. Eyebrow dye is the solution for the loss of eyebrow hair and the shape of the eyebrows. At Boozyshop we sell eyebrow paint that makes your eyebrows stand out! Painting the eyebrows yourself is becoming increasingly popular. It is therefore a cheap, easy and fast way to provide for a longer time of flawless hints. At Boozyshop we have different types of eyebrow dye in our range. We have semi permanent eyebrow dye that stays for a few days, but also permanent dye that you can enjoy for a few weeks. 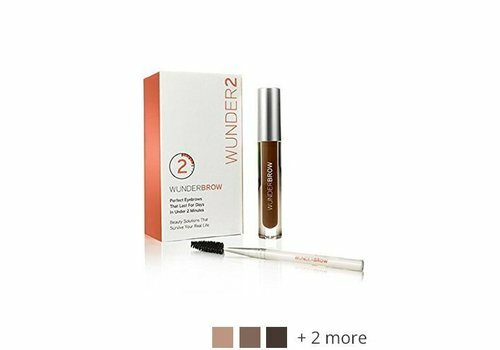 At Boozyshop you can buy the best and cheapest eyebrow dye, so you can get up every morning with perfect eyebrows. Make sure your eyebrows are make-up free, clean and completely dry to achieve an optimal paint result. Apply some vaseline to the skin around the eyebrows. Because of the petroleum jelly, there is no paint on the skin. Read the instructions for use of the eyebrow paint well before you apply the paint. Apply the paint to the eyebrows with a brush. Try to paint your eyebrows as close to the skin as possible, but avoid putting the paint on the skin. Tip: do not apply too much eyebrow paint immediately. If the color turns out to be too bright afterwards, you can always paint the eyebrows again for a better result. Leave the eyebrow paint as long as the product's instructions for use are described. Remove the paint with moist cotton swabs or tissues and say hello to your fleeky eyebrows! Note: always read the instructions for use of the relevant eyebrow paint, because the preparation and treatment can vary per product. Buy your eyebrow paint at Boozyshop now! Do you want your eyebrows on fleek for a long time? Then eyebrow paint is the solution! With eyebrow paint you make sure that you create perfect eyebrows that do not need to be done for days or weeks. With an order above € 30, - you receive a free gift. Do not wait any longer and order your eyebrow paint at Boozyshop today!